Small but lively city and university town. Bangor Cathedral has ancient roots – this religious site can be traced back to the 6th century. The former Bishop’s Palace has been refurbished as the new home for the museum and gallery, called Storiel. Art and local artefacts are on display here, along with an information hub for Ein Treftadaeth – Our Heritage. Bangor has lots of leisure facilities including pool and a pier where you can enjoy a favourite local treat of tea and fresh scones. A good shopping scene too along what’s reputed to be Wales’s longest High Street, boosted by the modern Deiniol and Menai centres. 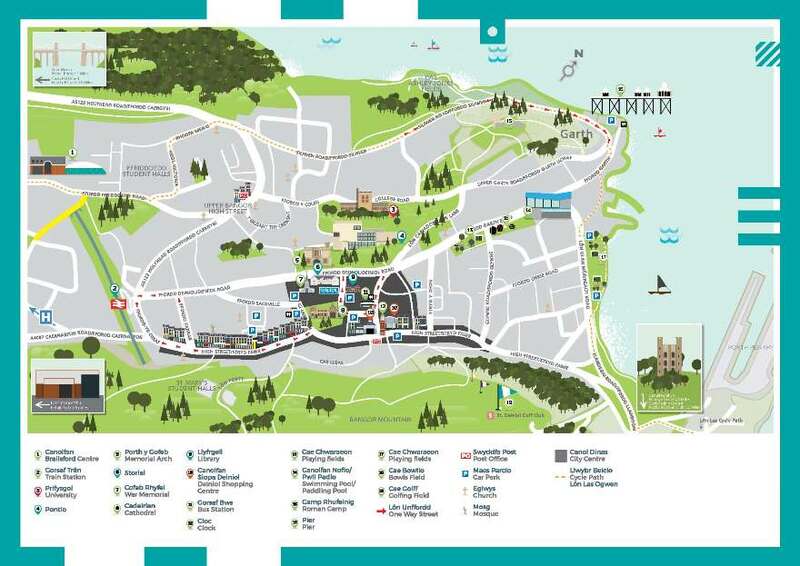 Visit the iconic Pontio, a venue for theatre productions, film, music, circus, dance and other innovative performing arts. And don’t miss dramatic Penrhyn Castle, the National Trust mansion set in beautiful grounds on the outskirts of town, and nearby GreenWood Family Park, a popular family attraction.